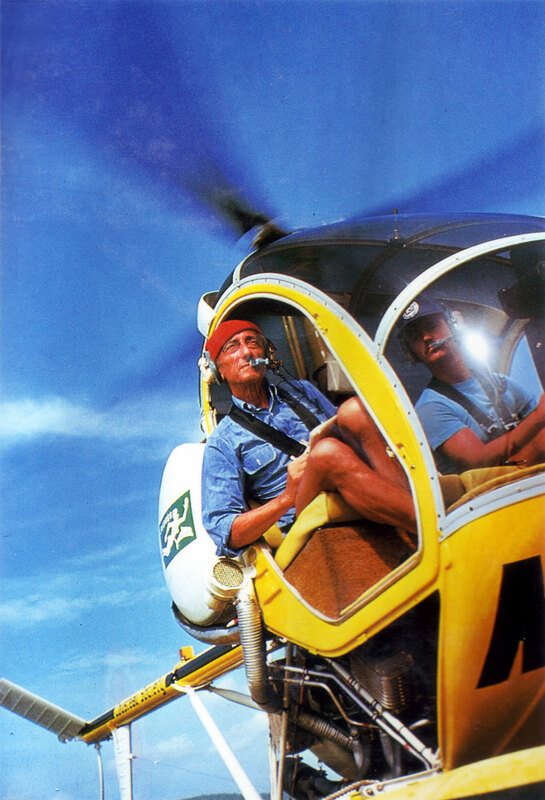 In the photo below, Captain Jacques Cousteau supervises from the bridge of his Calypso, a lift-off of the helicopter from the pad installed on Calypso's bow. It appears they are somewhere in the Antarctic. 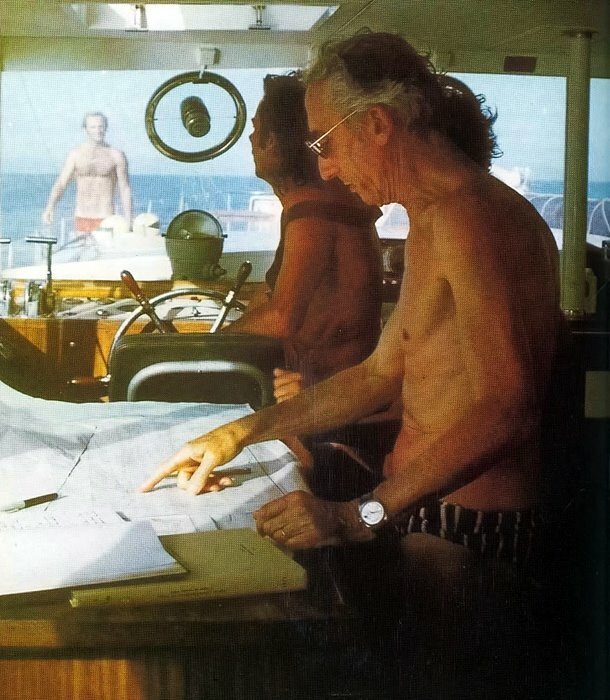 There were Rolex Submariner's on the wrist of many of the crew members aboard Calypso including Philippe Sirout pictured below with Captain Cousteau in Calypso's radio room. 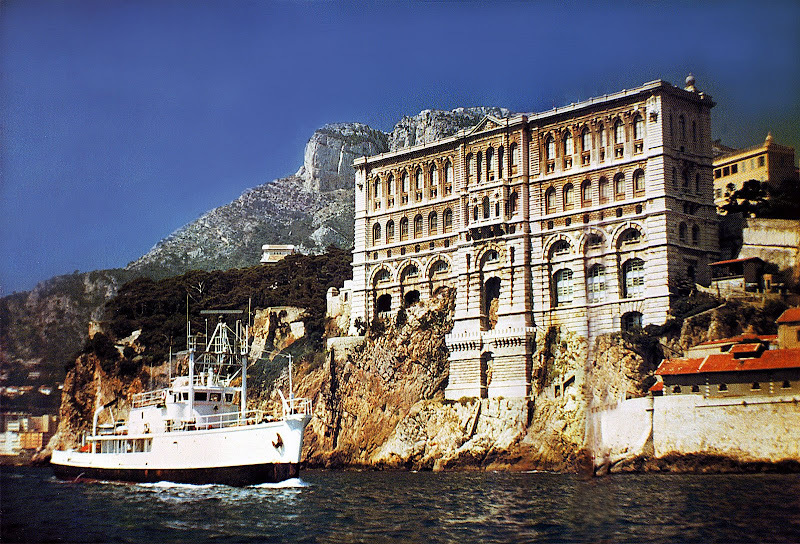 Jacques Cousteau was the Director of Monaco's Oceanographic Museum from 1957 until he died in 1997. In the photo below you see the Calypso passing the Museum which was amazing because the Calypso cruised all over the planet which made it a truly international symbol of adventure. 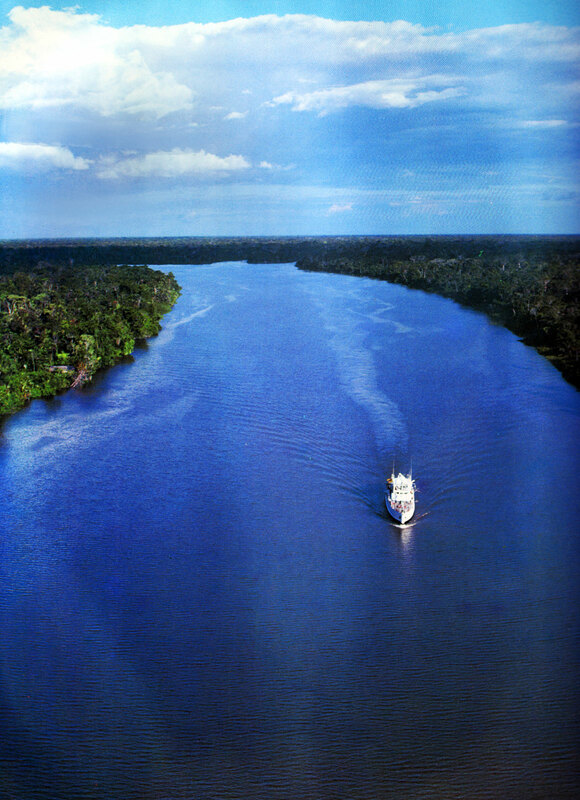 As I previously mentioned, the Calypso traveled all over earth, and it is pictured below traveling down the Amazon river in South America. 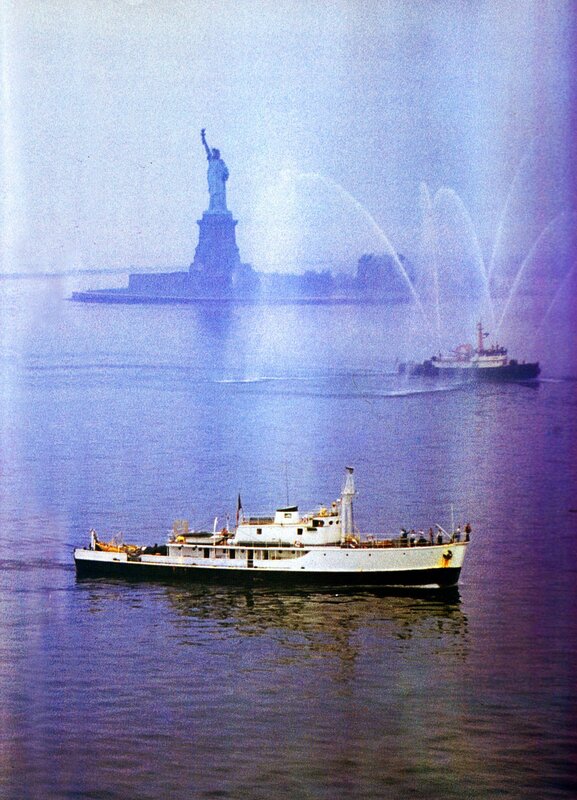 In the photo below we see the Calypso as she enters New York Harbor with the Statue Of Liberty in the background. 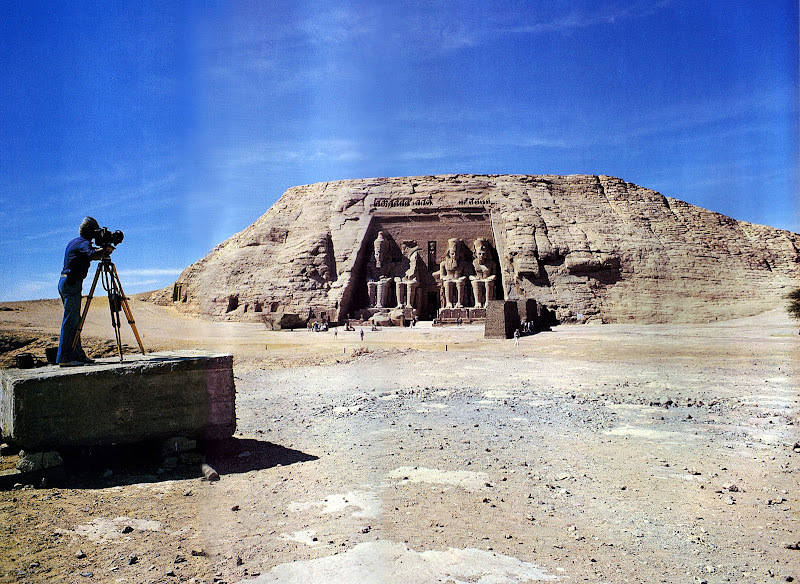 Jacques Cousteau took the Calypso down the Nile and the photograph below was taken of a Cousteau cameraman taking footage of the Temple of Ramses II at Abu Simbel in Egypt. 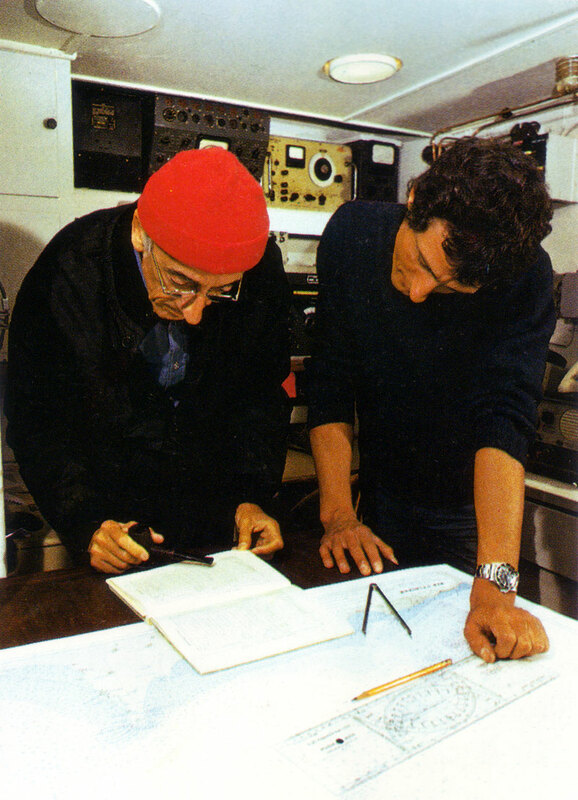 Cousteau and the Calypso team traveled through every ocean and sea on earth during their travels. 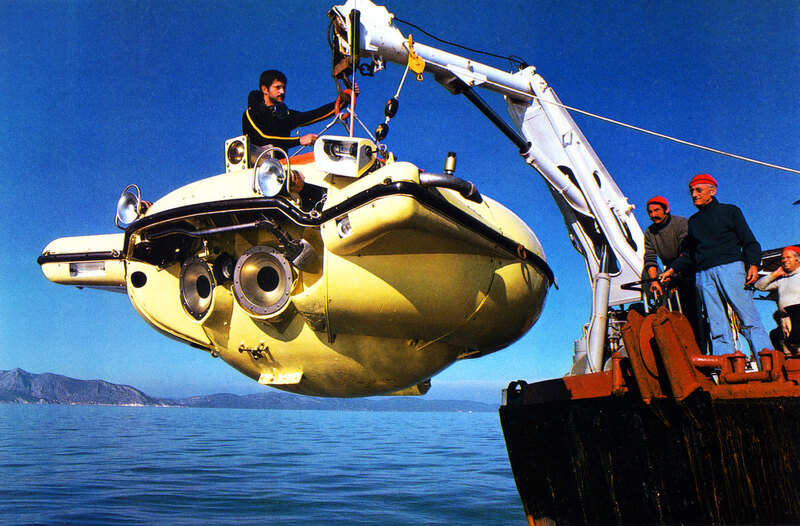 The Calypso was extremely well equipped with innovative technology to capture the mysteries of the ocean including the SP-350 diving saucer, which is pictured below as it is prepared for work in the Aegean Sea. 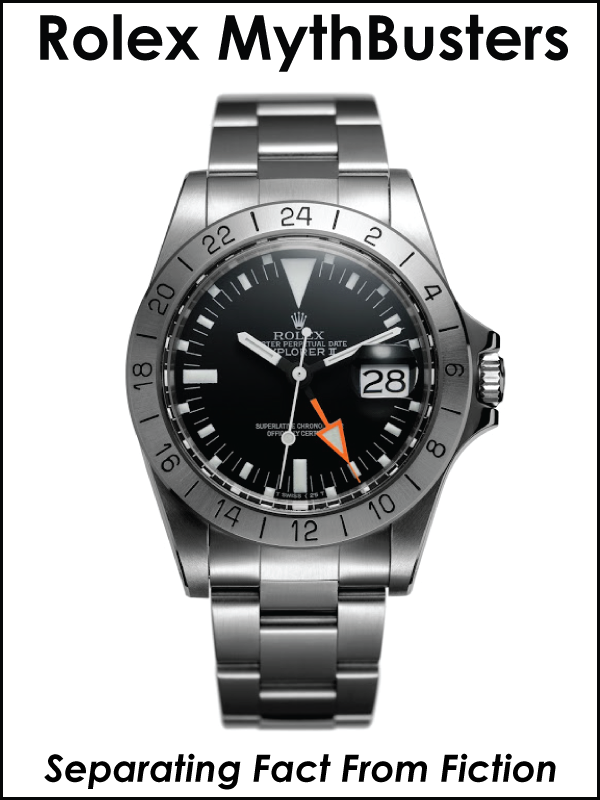 T. Walker Lloyd, was a famous deep sea diver and ended up working as an executive for Rolex for a quarter century and he was very close pals with Philippe Cousteau, and knew "The old man" as he typically referred to Jacques Cousteau. 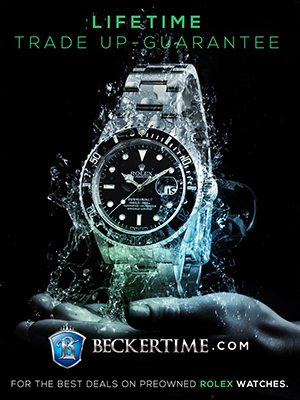 T. Walker mentioned to me in a yet to be released podcast interview I did with him, that Jacques Cousteau was very close with Rene-Paul Jeanerret who was the director of Rolex in Switzerland and was largely responsible for the development of the Rolex Submariner and the GMT Master as tool watches. 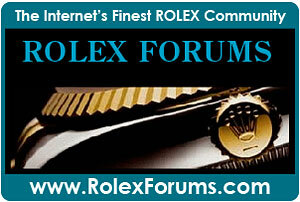 Jacques Cousteau is picture below wearing his platinum Rolex Day-Date. Captain, Jacques Coustea is pictured below with Dolly, a dolphin trained in reconnaissance by the United States Navy in the canal waters located in the Florida Keys. 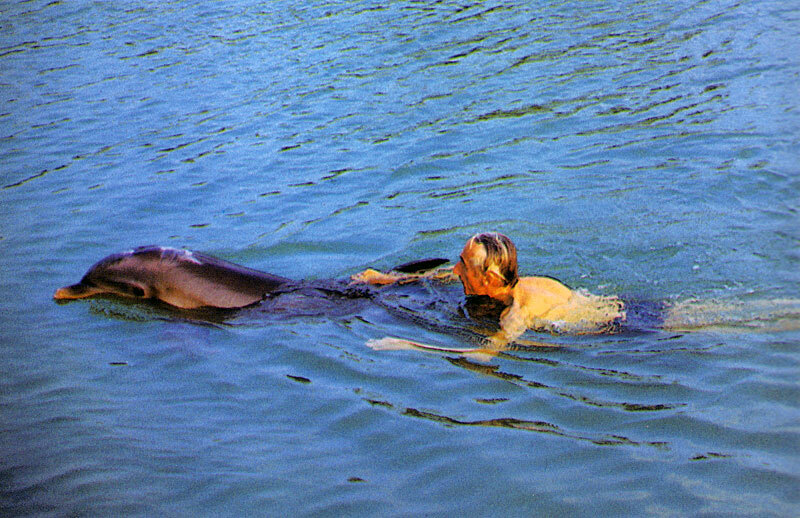 What an amazing man and athlete, swimming with dolphins well into his 70s. 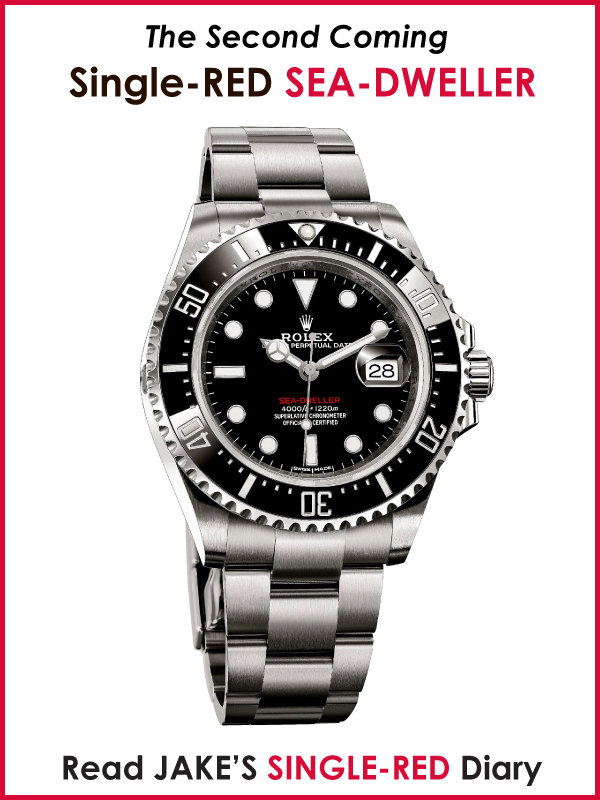 There is not nearly enough room on Jake's Rolex Watch Blog for me to write about the significance of Captain Jacques Cousteau's accomplishments and achievement, but in the future I am certain we will be exploring his amazing legacy further. 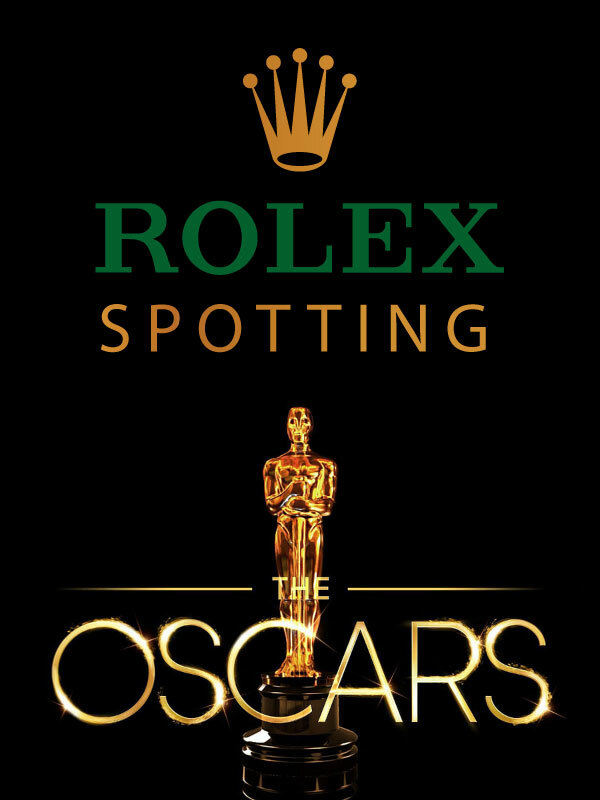 I would like to dedicate these two videos to my pal Abel in Buenos Aires, Argentina. Memories are made of this and it does not get more classic than Rod Sterling narrating for Jacques Cousteau!!! 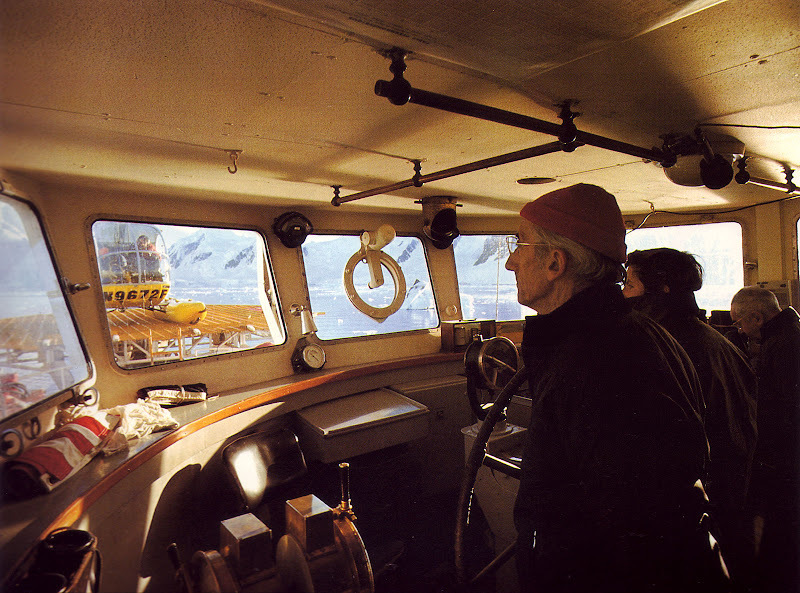 If you have never watched Jacques Cousteau, you are in for a treat. 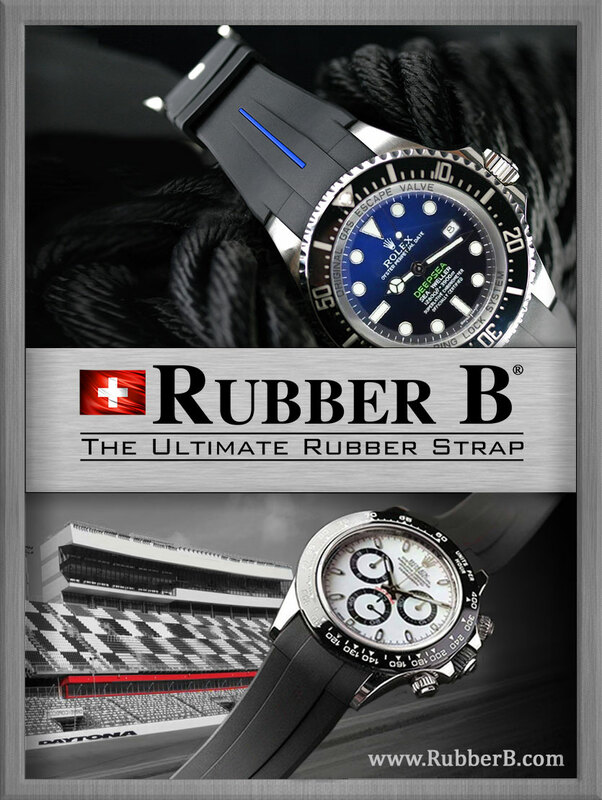 This is as real as the real-deal gets and in the video above you see Jacques Son, Philippe wear his Rolex Submariner as well as the Calypso Research Ship, Helicopter, Hot-Air Balloon and Saucer Diver in action. Footnote: I have heard people criticize Jacques Cousteau by saying he was a showman or some kind of charlatan and I am going to step in and defend Jacques by stating that this notion is absurd. I am sorry, but there is no way in the world that a man who is swimming with dolphins and scuba diving well into his eighties is not the real-deal. Look at the photo of him on the bridge of the Calypso in the photo above in this story and tell me that is not real. 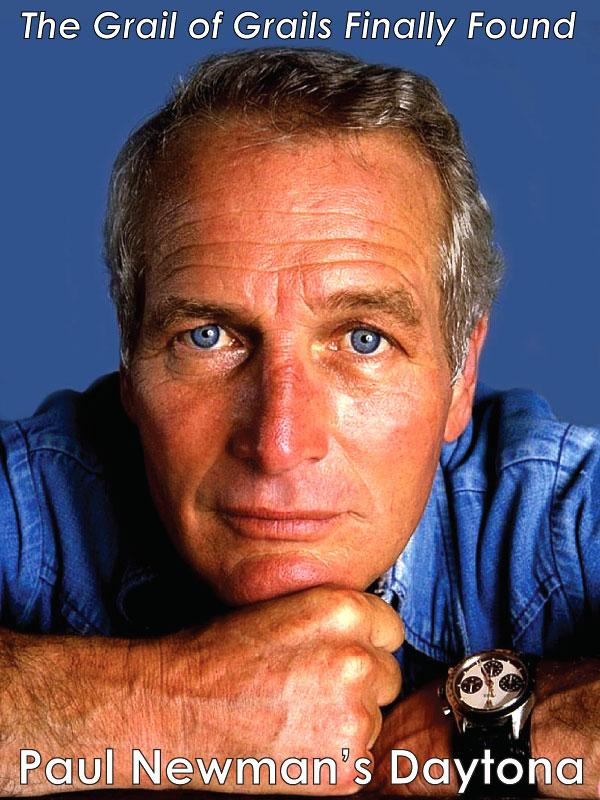 I say Jacques was as real as real will ever get and I also believe that he is as great of a hero as Mother Theresa or Paul Newman. Despite any foibles–which we all have–Jacques Cousteau's contributions to mankind are immense and typically beyond measure!!!!!!!!!!!! 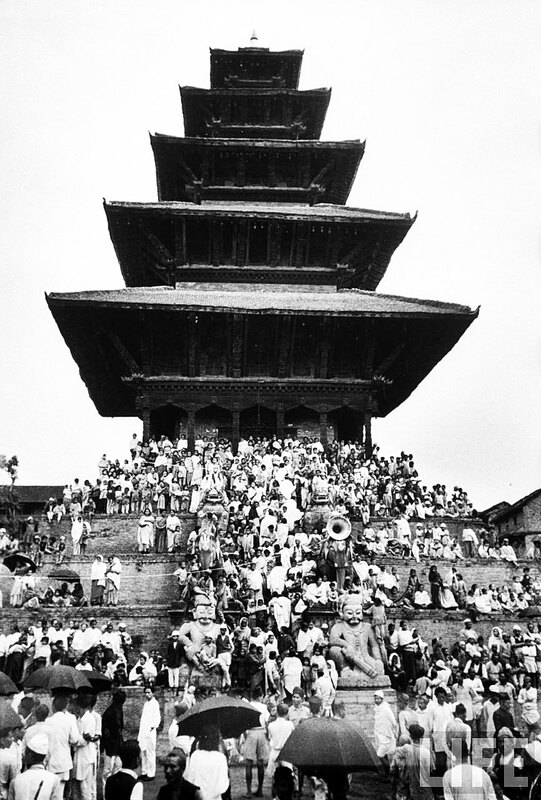 There was a parade through Nepal that welcomed the expedition team that conquered Mount Everest. There were many well wishers who were excited to celebrate the expedition teams outstanding achievement. 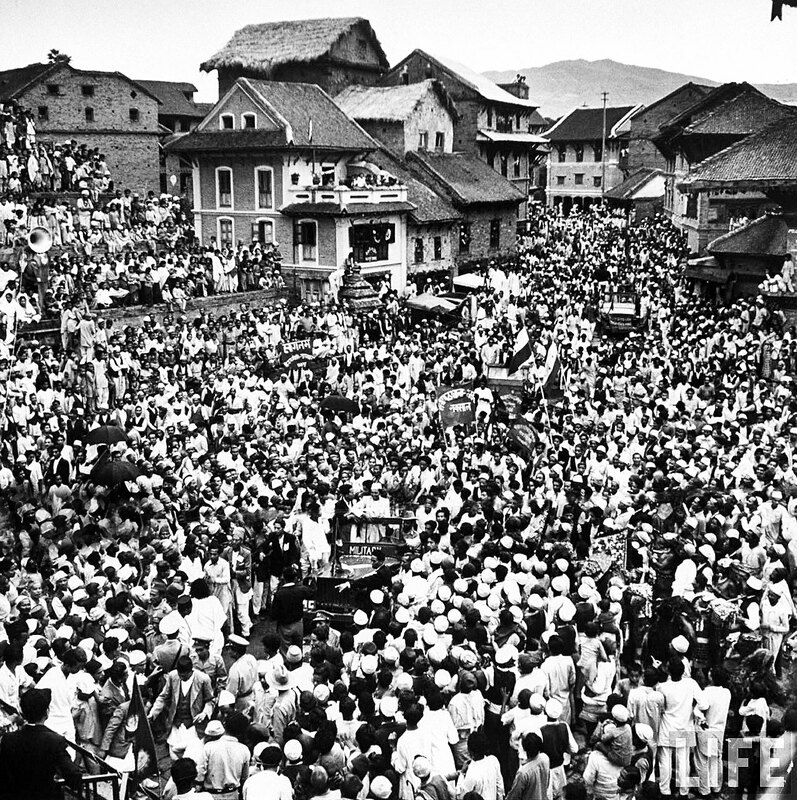 In the photo below the parade passes Dubar Square in downtown Katmandu, Nepal. 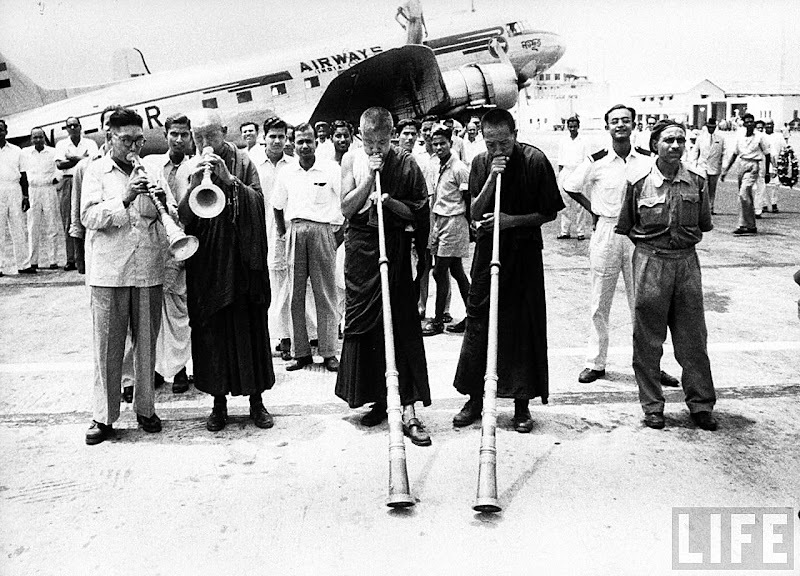 After the parade through Nepal, the climbing party got on an airplane and headed for India. 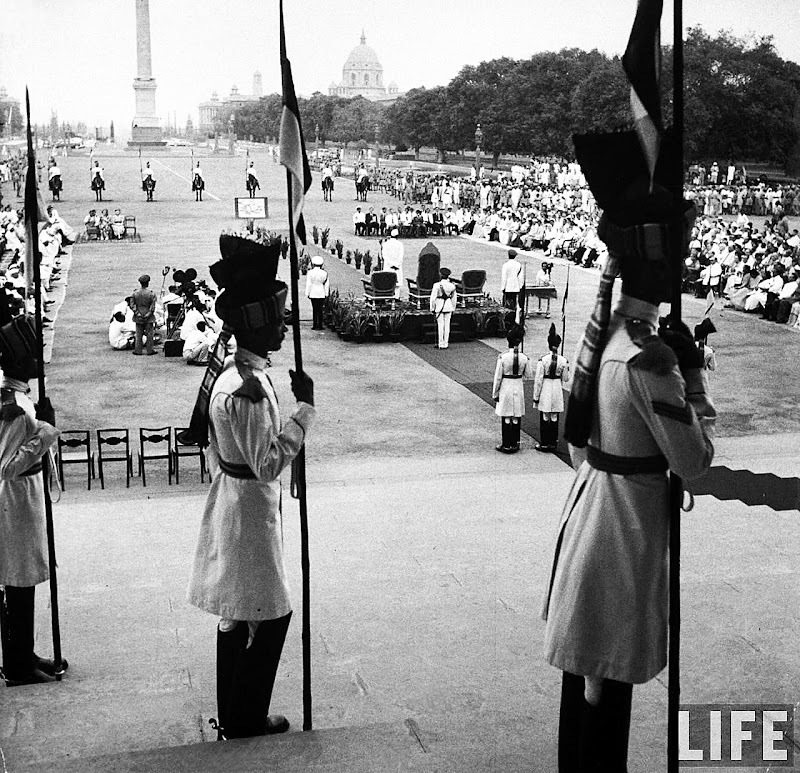 The photo below is of the reception that was held in the honor of the Mount Everest expedition team and that is Jawaharlal Nehru standing on the podium with his hands behind his back. 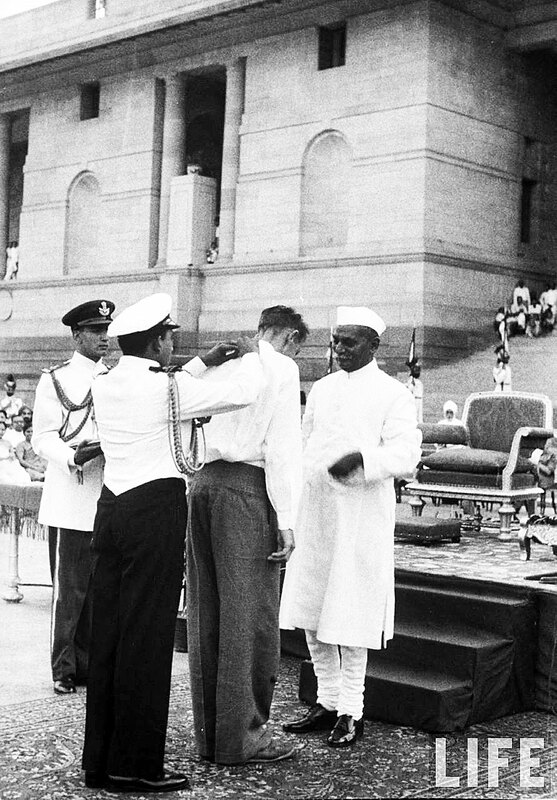 The photo below is of Nehru awarding Edmund Hillary with a medal of honor. 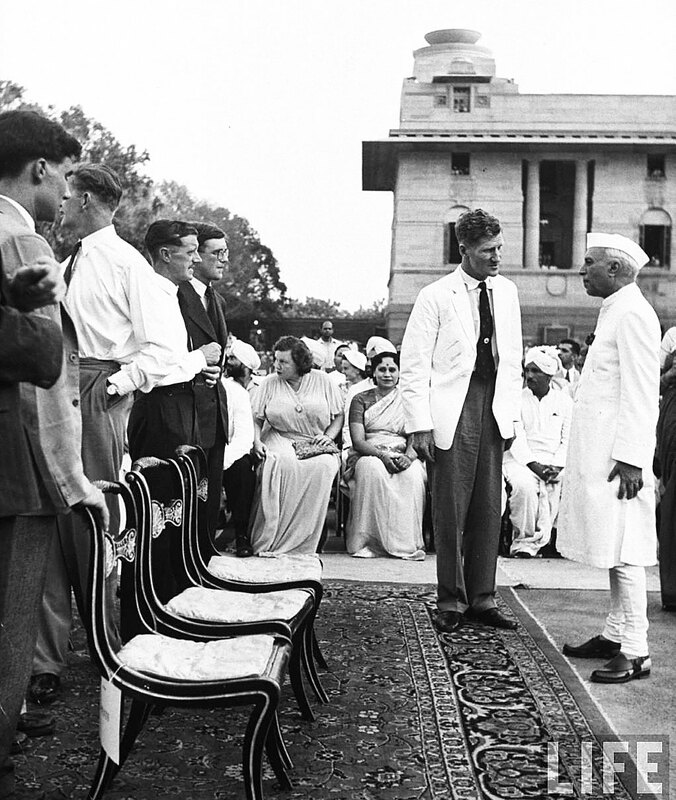 In the photo below, Jawaharlal Nehru is talking with Sir Edmund Hillary after his successful conquering of Mount Everest, with other members of the expedition team looking on. Jawaharlal Nehru was crazy about Tenzing Norgay and pronounced that Tenzing was of Indian descent. 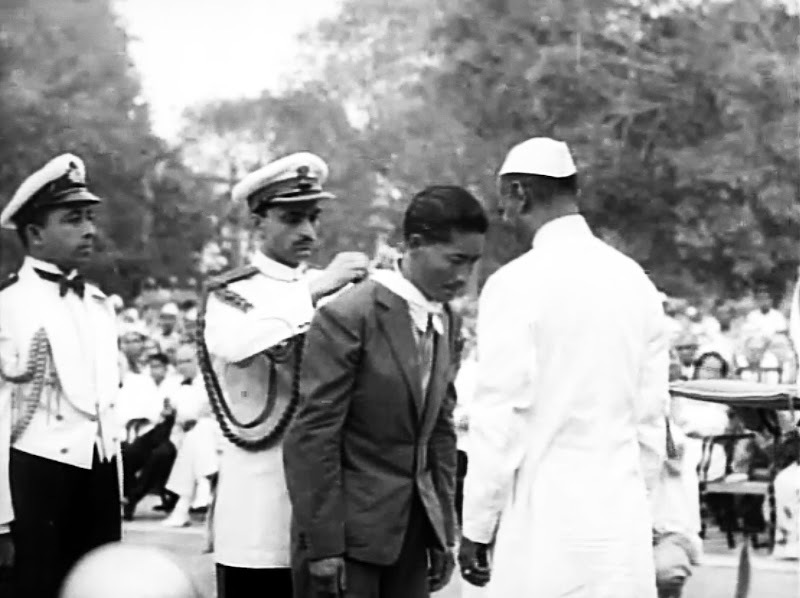 Tenzing is pictured below being awarded by Nehru. 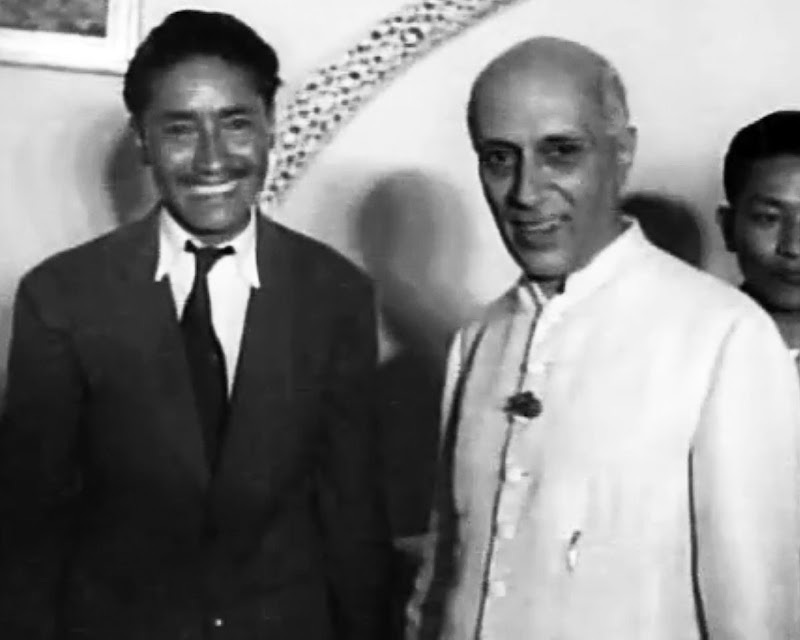 Tenzing is pictured below with Nehru in a reception after the award ceremony. 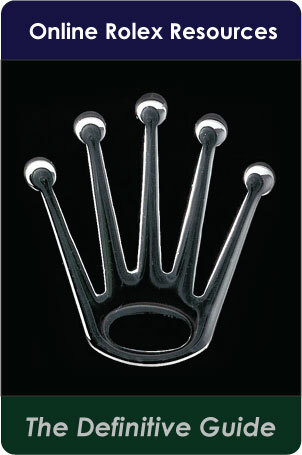 While in India a huge controversy broke out. According to Edmund Hillary, Tenzing signed a document saying he made it to the summit first, ahead of Hillary. It was then learned that Tenzing did not understand what he signed and Tenzing and Hillary signed a statement saying they both made it to the summit next to each other. 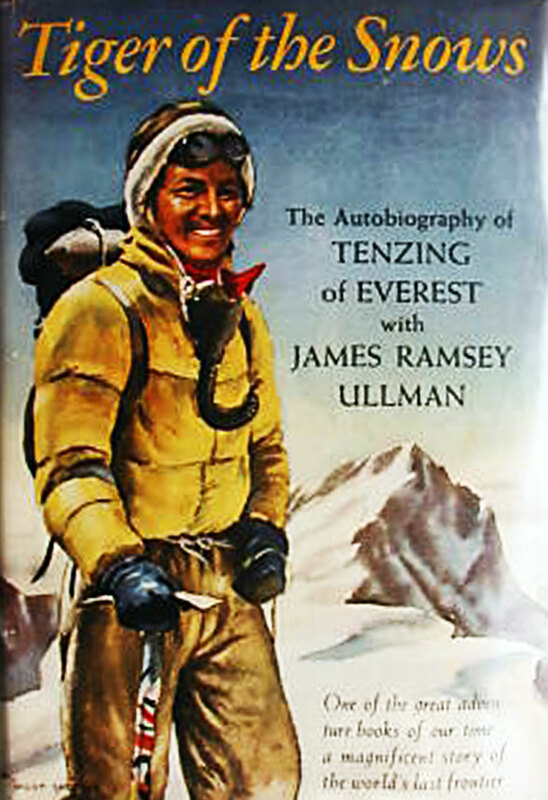 Years later, in his his book, View From The Summit, first published in 1999, many years after Tenzing died, Hillary broke his silence and said that he made it to the top first, not Tenzing. 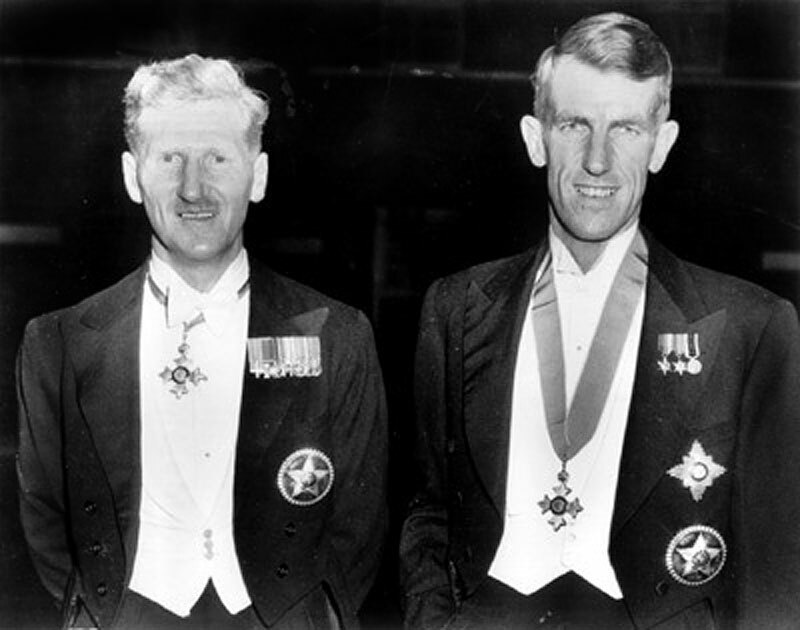 Edmund Hillary and John Hunt traveled to England where they were knighted by young Queen Elizabeth II. After climbing Mount Everest, Sir Edmund Hillary was considered to be one of the top explorer's on earth. in 1954, Hillary was on another Himalayan expedition, high on a peak neighboring Everest where he broke three of his ribs while rescuing one of his fellow climbers. 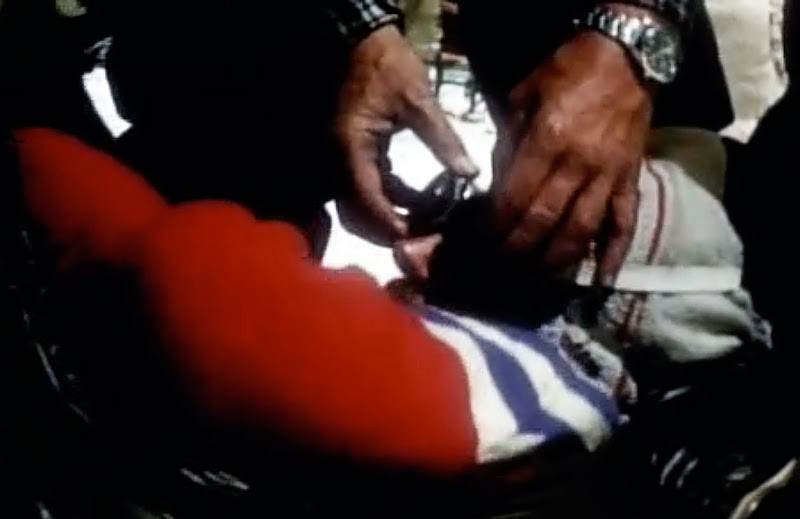 He then caught pneumonia, and had to be removed from the mountain on a stretcher as seen below. Ironically, this is the only photo taken during Hillary's climbing career where I believe I can positively identify a climber wearing a Rolex. 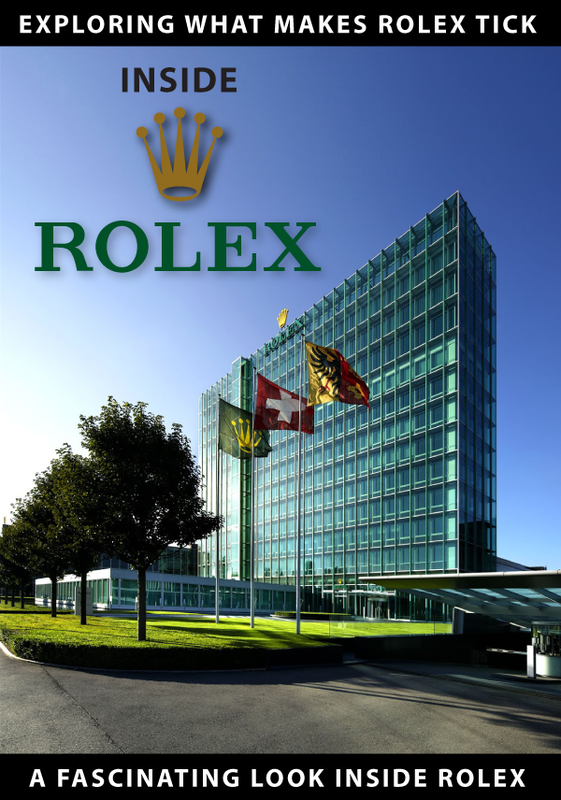 In the photo above of Hillary being put on a stretcher, the climber taking off Hillary's goggles appears to be wearing a stainless steel Rolex Explorer. A few years later, Hillary suffered three high altitude strokes which would forever preclude him from high altitude climbing. 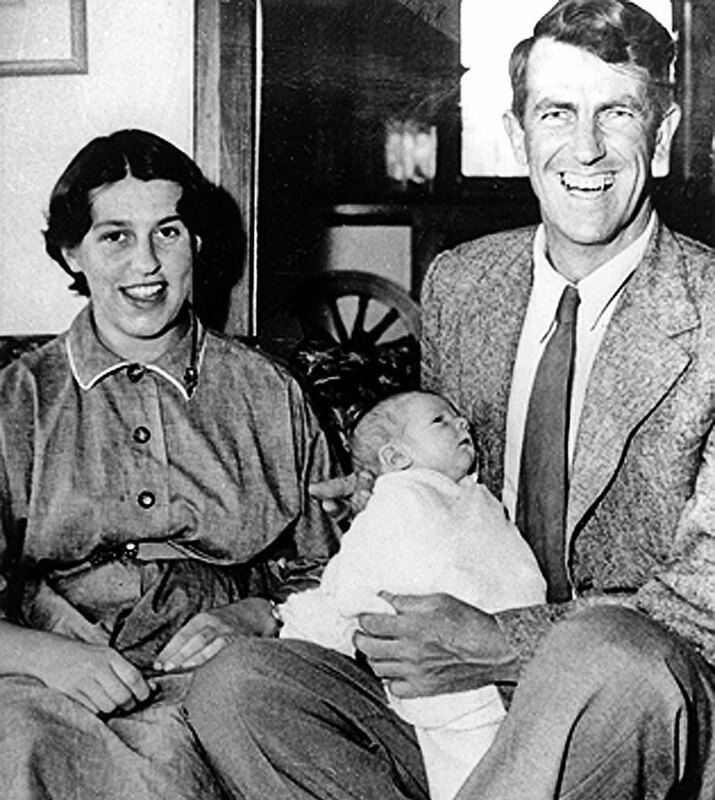 Four months after conquering Mount Everest, Edmund Hillary got married to Louise Mary Rose, who was a daughter of a mountain climber. Louise was 11 years younger than Edmund. They had three children together, a daughter and two sons. 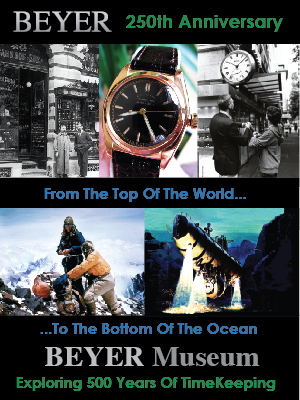 One of their sons, Peter would follow in his father's footstep by reaching the summit of Everest many years later. Louise and Edmund are seen in the picture below. In 1975, tragedy struck Edmund Hillary when his wife Louise and daughter Belinda died in an airplane accident over the Himalayas while they were coming to visit him. 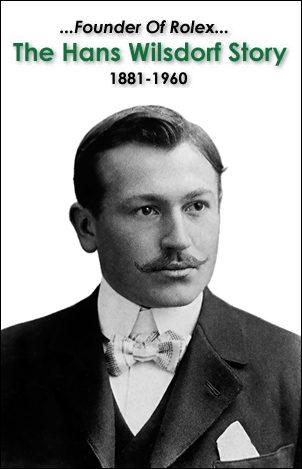 Edmund suffered for years over the tragedy, and blamed it on himself, because his wife never felt comfortable traveling aboard small airplanes all over the world to visit him and he realized he had pushed her against her will to do so. He was so upset that he contemplated suicide, but over the years he was able to move on. Edmund Hillary was a man who experienced the highest of highs and the lowest of lows. Sir Edmund Hillary is considered to be one of the most beloved and trusted New Zealanders. His portrait is commemorated on the New Zealand Five Dollar bill as seen below. After their successful climb, Tezing Norgay became an internationally famous figure. As with most fame, it was a blessing and a curse. Tenzing wrote an autobiography named The Tiger of the Snows which was a big hit. 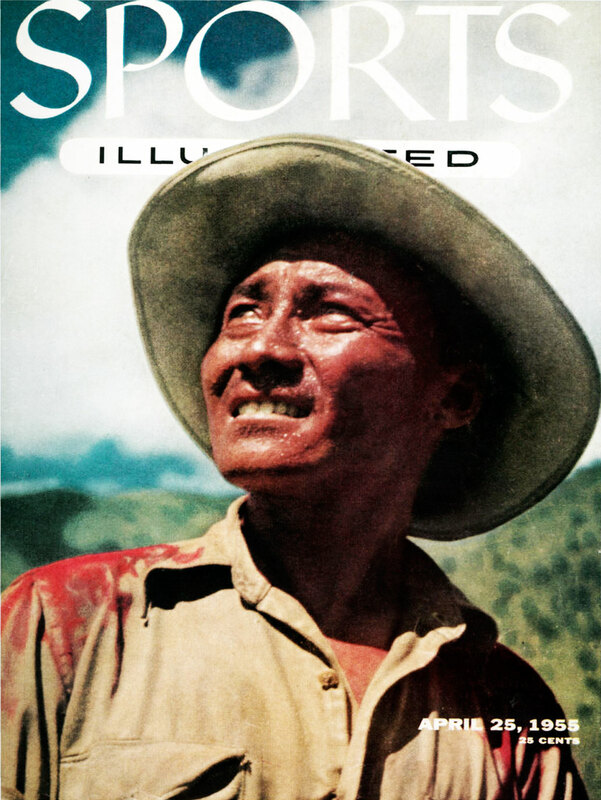 Tenzing Norgay appeared on the Cover of the April 25, 1955 Sports Illustrated. Sports Illustrated was so enamored with Tezing's success that it ran a four installment article covering his book, The Tiger of the Snows. In the photo below Tenzing's shoulders are covered with vermilion powder that was sprinkled on him as a sign of adulation by Nepalese villagers. 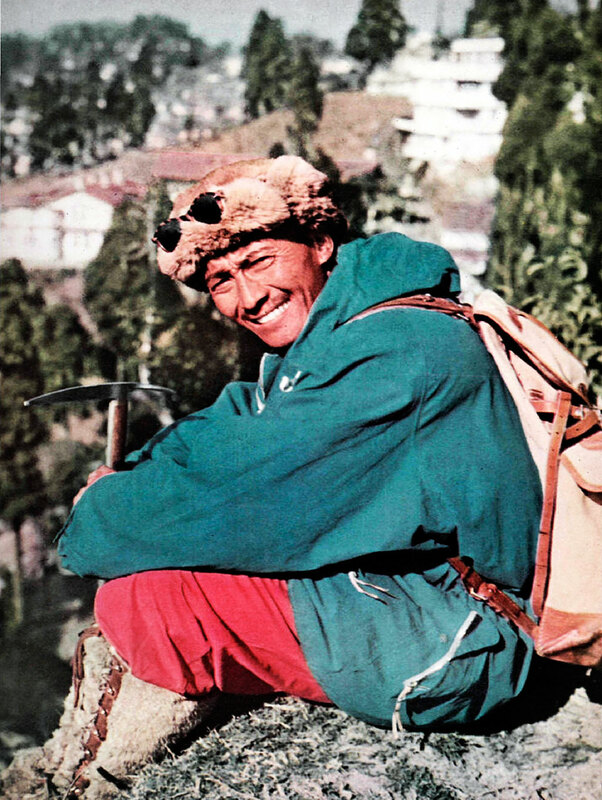 Tenzing is pictured below in a photo that appeared in Sports Illustrated in 1955. In 1955 Tenzing must have felt like he was still on top of the world. In the photo below, Tenzing had a rare family reunion in Darjeeling with three generations of his family. 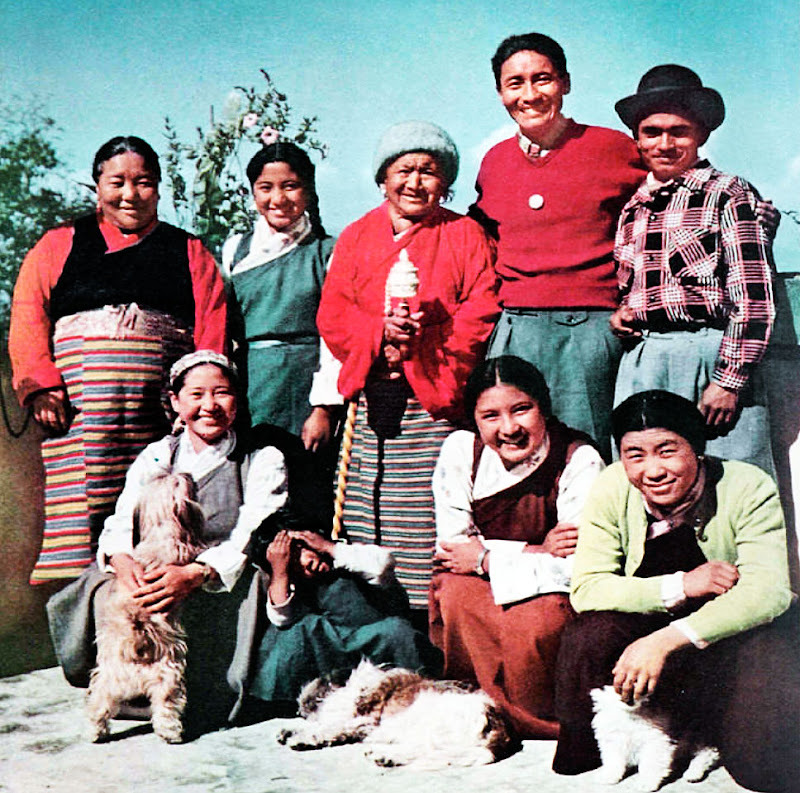 Pictured from left to right on the top row: first wife, Ang Lahinu, daughter Nima, aged 16, Tenzing's mother, Tenzing. Bottom Row, Older daughter Pem-Pem (18) is sitting with her Tibetian lap-dog. Others in photo are Tenzing's cousins.